Have you ever dreamed of creating your own personal cloud? Now you can with OwnCloud. In this article you’ll get a glance of what OwnCloud can do for you. 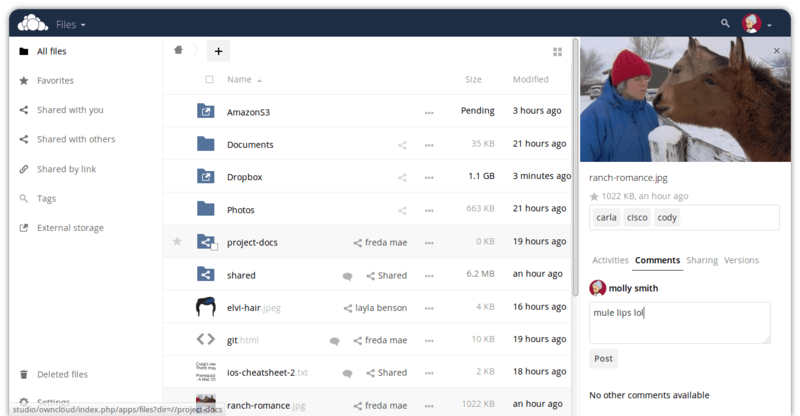 File storage: OwnCloud is first and foremost a self-hosted alternative to Dropbox. You can access the files either using the Web UI or you can use WebDAV which is supported by all major operating systems. File versioning: files history is kept in OwnCloud, allowing precedent versions of the same document to be restored. File synchronization: by using the client you can synchronize local folders to/with the server. The client is freely available for Windows, Linux and Mac OSX. Mobile clients are available for Android, iOS or even BlackBerry (with a little price). Multi-user: OwnCloud has support for multiple users with granular access to files. It also supports centralized users with the LDAP plugin. File-sharing: You can share files or entire directories with local users on the same server (and control their permissions). Federated cloud: this feature enables to share files (and other things) with other OwnCloud instances (retaining full control over permissions). Modular architecture: OwnCloud is structured in apps that enable developers to add functionality to the core product. Calendar: with the Calendar app you can keep multiple calendars and even synchronize them across multiple devices that support CalDAV protocol. Contacts: much like with the Calendar app, the Contacts App allow you to keep your contacts and synchronize them using the CardDAV protocol. Open Source: it always figures last in my lists, but to tell the truth it should always be the first item. The possibility to look inside the code makes you feel confident about what the software is doing and that it is not spying on you. This list is a bit short, you can find out all the new features on this page. Self-hosted: this isn’t entirely bad, but if you have a flat internet connection, no domains or no system administrator experience, it might be a bit bad. OwnCloud is heavy: written in PHP, with a modular approach. That’s bound to be heavy. In order for it to be fast you should set up at least PHP 7 (which brings huge improvements), some kind of cache and be sure to optimize everything in every way. Updates: unless you design your very own way to update, packages for your operating system will often be a bit late and letting OwnCloud update itself may not always be the best option. Client is buggy: I’ve never experienced it myself but I’ve seen some users on the Internet saying some of their files were silently gone due to low space or things like that. Personally I’ve experienced that the speed comparison between Rsync and the Client is really too much to bear, Rsync being sometimes six times faster. That doesn’t really happen with small files, but with big files the difference becomes visible. You’re now aware of OwnCloud, a simple and complete solution to your storage, synchronization, calendar, contacts needs and much much more. You’re also aware of the downsides and how to partially avoid them. If you’re still not convinced you can find a demo of the web interface here. Be sure to continue following, in the next few weeks I will post tutorials on how to install OwnCloud on the major Linux operating systems. Previous story What is a Virtual Machine?